Synopsis- Kirsty Mitchell is ready to come home. After a tragic accident that left her scarred, she fled overseas. Now, three years later, she’s finally returning to Flame Tree Hill, her beloved family farm. But at twenty-five Kirsty isn’t prepared for the terrifying new challenge ahead: breast cancer.Kirsty’s never been a quitter and that’s not about to change. But can her budding romance with local vet Aden bear the strain? As she battles with chemotherapy and as her past threatens to overwhelm her, Kirsty realises you can ever take anything – or anyone – for granted. Drawing strength from her family and the beauty of Far North Queensland, Kirsty finally understands what she must do. A lyrical and heartwarming testament to the power of love – and forgiveness. 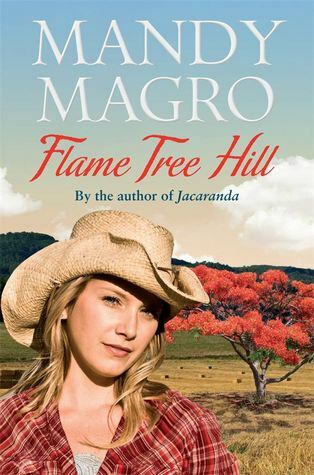 Review- Flame Tree Hill is the third rural fiction novel to be released by Mandy Magro. This time around she introduces protagonist Kirsty Mitchell who not only has unresolved grief and guilt following a car accident that killed her friends but also has to deal with a diagnosis of breast cancer. The uncertain prognosis comes along just when she started to get her life together, she’s moved back home to the family farm from a stint abroad, she’s working hard and she’s just started to date her brother’s best mate Aden whom she’s been in love with her whole life. Their budding romance is heavily impacted by her health but Aden remains a steady and stable figure in her life. This book was really not what I expected. After reading Magro’s first two novels I thought this would be a rural romance but this story doesn’t really fit as a romance for me. There’s certainly the new relationship between Kirsty and Aden but it really is pushed to the wayside as Kirsty focuses on her health and undergoes chemotherapy. I thought the author quite sensitively explored the impact of the cancer on Kirsty from not only the drain on her health but also her emotional wellbeing. Kirsty was already dealing with a lot of emotional turmoil from the accident and she struggles with her mood and coping with the uncertain future the cancer and chemotherapy bring to her life. For the most part Flame Tree Hill is quite sad and heavy. There aren’t many light moments for the majority of the story, though there are some nice intimate moments with Kirsty and her Aunt and at times Aden. I did feel quite sympathetic toward Aden who obviously cares and loves Kirsty but he struggled to stay strong when her mood was all over the place and she quite often rejected his offers to help. I also found the dialogue at times felt a bit unnatural and some scenes were a bit rushed, particularly between Aden and Kirsty. The ending provides a nice resolution about Kirsty’s health and her relationship with Aden but I did feel a little flat when I finished up. I’d hoped that there’d be more focus on the relationship with Aden and Kirsty, but this was really a minor plotline to the real story which was about Kirsty coming to terms with her past, and overcoming the difficulties with her health. It was hard to read Kirsty’s low points but it was reassuring when she moved past this difficult time in her life with the support of Aden and her family and found peace with her past.Flame Tree Hill explores the impact of illness on not just the individual but also their partner and extended family.